PONGAL in my mother tongue (Tamil) literally means 'to rise', denoting how the ingredients of this dish 'rise' when boiled and cooked. Pongal is a very positive word in Tamil. It also means 'prosperity' and is associated with a lot of optimism. Pongal is the name of the Tamil harvest festival (that falls in mid-January every year). The fun part of the festival is, when everyone in the family gathers around a brass vessel filled with the Pongal ingredients and wait for it to boil over - and then everyone screams 'Pongalo Pongal!'. The festival of Pongal is a separate blog topic in itself, so I will stop with one last trivis. The Tamil harvest festival occurs during the month of 'Thai' in the Tamil calendar (coincides with the month of January). This month of 'Thai' is considered very auspicious for new beginnings. And, Pongal is also the name of one of the most healthiest breakfasts in Tamil Nadu. Pongal is the epitome dish of what you would call a 'balanced diet'. It totally makes sense and you would agree with me when you hear the ingredients of this simple but tasty dish. It has 2 parts rice (carbohydrates), 1 part lentils (proteins) and for garnish there is the glorious Indian Ghee or clarified butter (fat). If this is not a balanced diet, I do not know what is?! And of course, during the age-old ritual of screaming 'Pongalo-Pongal' when the Pongal is almost ready to boil over during the harvest festival each year. With all this nostalgia building up, I just had to make Pongal and the side (called Gotsu) my mom always made that accompanied Pongal - like they were made for each other. There are tons of ways of making these dishes, one such recipe can be found here. If I may say so myself, my Pongal and Gotsu turned out to be pretty freaking good, see below. The wine pairing can be quite tricky for this dish. This is mainly because the risotto (Pongal) is quite bland by itself. But, the side (Gotsu) with the tangy tamarind sauce and meaty eggplant can be quite palette-invigorating. So I concluded that the wine needs to be high on fruit, low to medium with tannins, no oak, minimal earthiness and medium acidity. Once again, I stop by at Beltramos and make my usual stops at the wine section. I have to admit that I walked in with a bias towards Northern Italian wines. Precisely, from Piedmont. Even more precisely a Barbera or Dolcetto. But one particular bottle stopped me in my tracks. Nebbiolo?! It does fit all my requirements with the tannins, oak and acidity. But, I will be honest and say that every Nebbiolo I have tasted so far tasted like earth, mud and soil (and I say this with utmost love for this wonderful grape). So, I continue contemplating, until Gary (my favorite Beltramos staff) stops by and says that the wine I was eyeing pairs beautifully with Italian Risottos (which is comparable to the Indian risotto). Bingo! And he also reminded me of another major point. While most Nebbiolos fit my description, some (like this one from Gattinara) have the added fruit character because of the hillside vineyards (like this Travaglini's!) and south facing slopes - which automatically translates in to more sunlight and hence more sugar and fruit flavors. Okay, that sealed the deal for me! I have just 2 words Ladies & Gentlemen - Killer juice! Immediately after the first sip, I was hit with the red cherries and licorice flavors. Then there was a rounded wholesome feel that made this wine very smooth and so easy to drink. And at the very end, there is definitely forest floor and some earthy flavors. What a wine! Well worth every penny. I douzed the Pongal with Gotsu and ate a mouthful. Then dutifully sipped on the wine. I am reminded of our President Benjamin Franklin's words: "Wine is constant proof that God loves us and loves to see us happy." I am happy - elated actually. Nebbia in Italian means 'fog'. Hence the name Nebbiolo, for the grapes that are the crown jewel of the foggy Piedmont region in Northern Italy.These wines are very special in the sense that they cannot ripen to the fullest because of the fog and minimal sunshine. But, this results in a frizzy acidity which is the trademark of these wines. 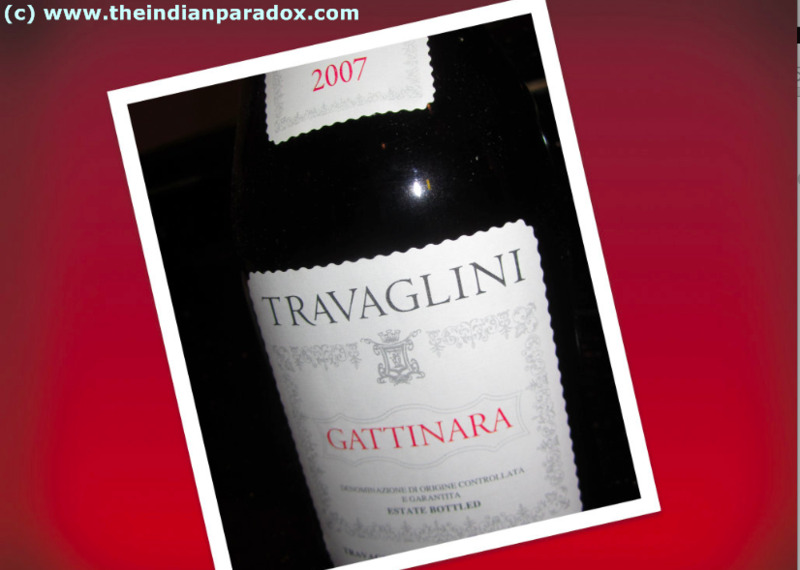 An easy to drink, refreshing taste that pairs beautifully with Italian pizzas and risottos. And now I can confidently add Indian risottos too to the many feathers in the Nebbiolo's cap!